The answer to these questions, and the myriad of questions that will inevitably follow, is to engage your people in the strategic journey. Do it in a way that motivates them to make meaningful progress – in a way that taps into their ‘intrinsic’ desire to make a meaningful difference. Forty years of behavioural science research has shown intrinsic motivation to be far more powerful than external (or ‘extrinsic’) motivation for business activities that require creativity and problem-solving. Exactly the sort of attributes we want to harness when undertaking the future-focused work of strategic execution. Dr. Teresa Amabile, Director of Research at Harvard Business School, has discovered an important twist – an employee’s intrinsic motivation is markedly enhanced when they make progress that serves a higher purpose. Her research shows that giving people something meaningful to accomplish enhances their creativity, productivity and collaboration. What’s more, seeing progress towards these meaningful objectives drives the desire to make more progress. By actively involving and supporting employees in the delivery of strategic projects, business leaders can tap into this ‘Progress Principle’. These projects can create a workforce that is more creative, has higher productivity, is more committed to their work and work more effectively with their fellow employees. This, in turn, creates a more nimble and adaptive business. As a business leader, you’re right to be concerned about shouldering the full strategic execution workload. You’re far too time and attention-poor to direct and control strategic activities on a daily basis. A senior manager’s greatest strategy-making value comes from setting strategic direction, creating a framework for pursuing your strategic objectives then supporting and enabling these strategic endeavours. However, it’s a fallacy to believe that an effective leadership lever for sustaining your strategic activities is to set strategic targets, measure outcomes relative to those targets then use external motivation – such as reward, recognition and recrimination – to close the gap between the two. Firstly, external motivation also requires constant attention to be effective – when the incentive goes away, so does the motivation. What’s more, the motivating reward or recognition needs to be constantly ratcheted up to continue delivering impact. Finally, studies have shown that external incentives and fear of punishment rank quite low as motivators for today’s workforce and, in fact, have a long-term detrimental effect where the work is non-routine and knowledge-based. 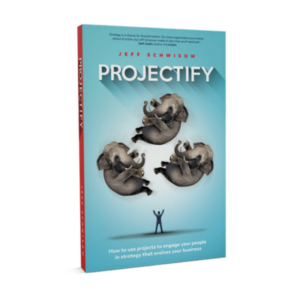 Most importantly, your strategic activities lose their efficacy when they don’t connect your people to your strategic intent in a meaningful way. Without a strategic context, your people are unable to apply their knowledge and experience of your customer interactions and the operational environment to the strategic change you hope to make. Unless they can see that their strategic contribution has value – and is valued – they will struggle to prioritise it over the urgent and important operational activities that already exist in their daily reality. Crucially, new strategic directions can’t deliver business value until they’ve been adapted and adopted by the people that will put them into practice every day – unless they’ve been tested by the people that must own them every day. In his book Drive: The Surprising Truth About What Motivates Us, Daniel H. Pink uses the last four decades of behavioural research on motivation to make the case for the long-term power of intrinsic motivation in today’s workplace. He explains how Type I behaviour – behaviour driven by internal desires rather than external ones – is the means to get your people to do their best work. If this is the structure on which intrinsic motivation is built, then Dr Amabile has identified the engine that will drive it forward. In 20 years of research examining the psychology and performance of people doing complex work inside businesses, she found a strong correlation between intrinsic motivation and creativity, engagement and performance – all very desirable Type I behaviours for the future-focused work of strategy. In one multi-year study, Dr. Amabile examined the daily diaries of hundreds of workers to determine what motivational forces were in play when they were delivering their best creative and productive performance. She found that of the five most commonly identified motivational factors (recognition, incentives, interpersonal support, progress and clear goals), ‘progress’ was the number one performance motivator for a knowledge-based workforce. In other words, creating opportunities for meaningful progress makes engagement and motivation self-perpetuating. As creativity develops and engagement grows then the progress you make derives even greater meaning – for the business and the people that are driving that progress. So how do you intentionally create opportunities for meaningful progress? The answer lies in projects – specifically, strategic projects. Projectifying the business’s strategic execution activities, not only shapes the business for the future that it aspires to, but also creates both meaning and progress for the growth of intrinsically motivated and engaged teams. Projects bring together meaningful strategic progress and meaningfully shapes your strategic performance culture. To make progress meaningful, visible and personal, ensure that you do the right type of strategic projects. Focusing them on a single strategic outcome makes allows employees to clearly see progress. Making the linkage between the project and the business’s strategic priorities makes that progress meaningful. Once your people are engaged in the business’s strategic endeavours and become intrinsically motivated by the difference they are making, they’re much more likely to bring creativity to those endeavours and progress them in a productive manner. The benefits extend to senior management as well. As your people become more engaged and more motivated, they become more self-directed. This allows you to trust them more – to use less of your time and energy telling them what to do and how to do it. Dr Amabile’s findings show that if the strategic work is meaningful, managers do not have to spend time coming up with ways to motivate people. This frees up your time and attention to make a greater strategic contribution – to establish a clear strategic direction and set strategic priorities, to create a strategic execution framework that leverages your people’s capabilities and experiences and support your project teams so you maximise the chance for strategic progress. Rather than focusing on the enormity of creating a strategy-making shift, focus on initiating meaningful strategic activity against which you can make progress. Then allow progress to drive more progress. Allow more progress to drive creativity, engagement and collaboration. That will create the organisational attributes that will become the strategic engine of your business. Do you set a strategic direction or expectations for strategic results? Do you motivate your strategy-making activities through external means or do you tap into your teams’ intrinsic desire to be part of something larger than themselves? Are you intentional about creating opportunities for your people to make progress that has meaning for the business and the place in which they work? I’d love to hear your thoughts and experiences in the comments below.